As usual, although I published a huge list of ideas and activities to help celebrate Children’s Book Week 2014, I’ve come across more wonderful ideas. I’m publishing them here in the hope it will help you and your kids connect to reading! If you missed the free PDF quizzes I created for Children’s Book Week, scroll down to find them here. Encourage NSW kids to enter the CBCA Connect to Reading Poster competition. Great prizes but hurry - it closes August 21, 2014. Find another class to connect with via the Book Week for Beginners Wiki. Consider swapping book reviews, Skyping for a book chat, sharing class blogs, even snail mailing! Here’s a class that used a combination of Google Docs and Google Hangouts to connect with their book buddies in another country. Grab this mini-book from TL Megan Daley with Connect to Reading Challenges! Take a peek at Children's Book Week activities planned for St Andrews Lutheran College in Queensland. Check out Making Connections. It's an interactive from Penn State where kids read a short story, then click on each student to see if their response of text to text, text to self, text to world or no connection is correct. Introduce your kids to ThingLink. It’s an interactive way of presenting information embedded into an image. What a cool way to show connections! Children could make a collage of the book covers they choose, and then embed links to the website of the publisher’s page about each book,or a favourite book review about that book, or an author page, or an interactive game based on the book. They could research and find connections to a chosen book, and embed links to videos, websites etc in an image they create. Read more about it in my article, Create Interactive Images with ThingLink. 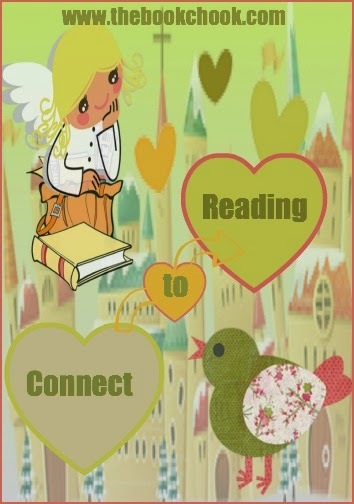 Download and print my free PDF of Connect to Reading bookmarks!, pictured above. Capitalise on children’s interests to help them to connect to reading. For instance, help young Star Wars fans find books about the Star Wars worlds, or LEGO Star Wars. I have lots of ideas in my article, Let’s Celebrate Star Wars Day! If you know youngsters who loves science, share science-related books with them, and show them online reading like the Lawrence Hall of Science’s 24/7 Science. Create a rap based around one of the short-listed books. Use Create-Raps.com to provide an instrumental backing beat. Teacher Librarian, Aveen, suggests it makes an excellent fit with the short-listed children's picture book I’m a Dirty Dinosaur: “(Create-Raps.com) provides an instrumental rap beat (lots of choices) with your voice(s) over the top and the save function is straightforward - no logging in or other fuss either …”. Have kids create a cartoon to persuade people that their chosen book is the BEST book in the world. Find ideas for using cartoons for persuasion in Using Cartoons to Persuade. Help kids make connections to library books. Spread out a collection of books chosen at random from shelves, or via other criteria (perhaps books treated in class, or from borrowers’ lists). Demonstrate choosing two books yourself and state the connection between them. Each student joins in, one at a time, adding one book, and stating a connection to one of the books already connected. Continue, hopefully until all books have been connected. Having the kids stand around the connected books, looking up, while you are perched on a ladder above, looking down to take a photo, might make an interesting though precarious record of the activity! Show kids how to present their own opinions about the books they read. Start from simple statements such as “I enjoyed it/I didn’t enjoy it.” and build from there - “ I enjoyed it because it was full of action.”/“I didn’t enjoy it because books about magic aren’t true.” Encourage children to speak and write about their reactions to what they read. If you’re looking for information on how kids can write a book review, check out my article, How Do Kids Write a Book Review? Check out the English resources available at TES Australia, and the PETAA Guide to the 2014 Shortlist. Take kids on a photo walk to look for connections both physical (e.g. interlaced branches, double adapters, a couple holding hands) and abstract (e.g. two kids poring over a book, a child with his hand up to answer a question). Share the images with each other, then choose one digital image to add a caption or poetry to. The result could look beautiful as a display. Try this five minute drama activity: Have one student go to the centre of a circle and make a repeated movement and sound. 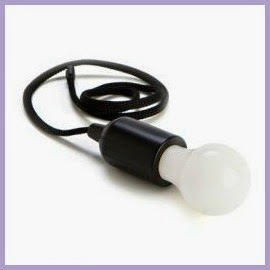 One by one, other students connect to this first person and make their own sound and movement. (The "sound" can also be words/phrases.) The whole group continues until you give a signal to freeze and hush, then in reverse order each student detaches from the group and returns to her place in the circle. Repeat the activity with a predetermined theme - e.g. "soccer carnival", "playground" or a book title the kids know. 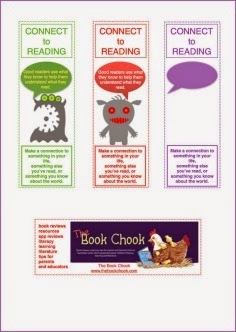 Add book-related print to the school environment using tips from Stanmore Public School Library. Encourage kids to read for pleasure! Grab some ideas from here. Into the Book - Making Connections A K-3 video that introduces the idea of careful readers making connections to what they read. The CBCA’s own Ron Brooks image is wonderful. Use it as model for students to delve into real art. Use your voice and body percussion to make your own war cry or chant for Connect to Reading. Write a book review in exactly six words. You can try to sum up the book, talk about your reaction to it, or respond to it in some way. Weave a god’s eye and attach a mini book to each spoke. Mini books can be made with folded card. Illustrate each front and back cover and fold around the spoke. Explore ways of connecting physical objects. How can you connect two sticks? How can you connect shells to branches? How can you connect goggly eyes to fence posts? Tell the world or one friend about your favourite book in a 90 second video. Type some book titles for books your class has read on this hieroglyph typewriter. Can you work out which 2014 short-listed title the image (above) represents? Take screen grabs of your chosen titles for a friend to decode. Make an alternative book cover for one of the short-listed books at Read Write Think. Listen to this great song, I’m Reading a Book from Teddington School (in video below), and create your own song for Book Week. Here are some ideas that you might be able to use, or that might spark a new idea from you. 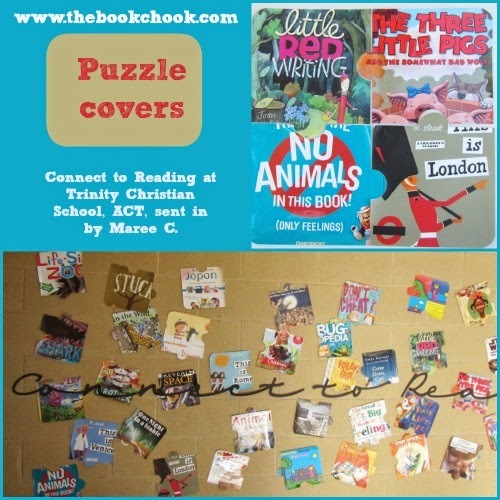 Photos (above) from Trinity Christian School, ACT, sent in by Maree C.
Create jigsaw puzzle pieces from old book covers to use in your display like those above. 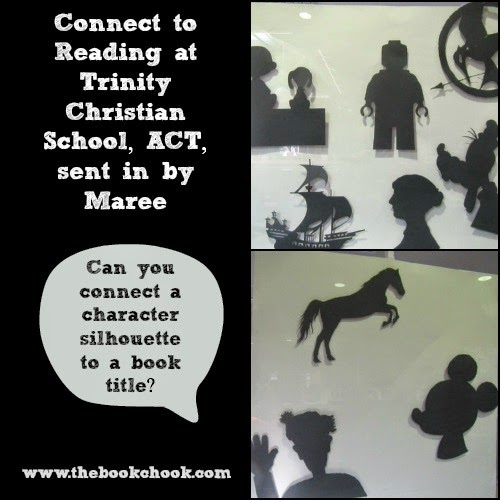 Connect to Reading at Trinity Christian School, ACT, sent in by Maree C.
Use book character silhouettes in a competition where children need to try to match each silhouette to a different book title. Here are some photos (above) from Trinity Christian School in the ACT. Dorothy Tonkin has some suggestions for simple book character costumes on the Random House blog. Here's a short Qwiki video from @julia_boulton with a lovely 2014 Book Week display. 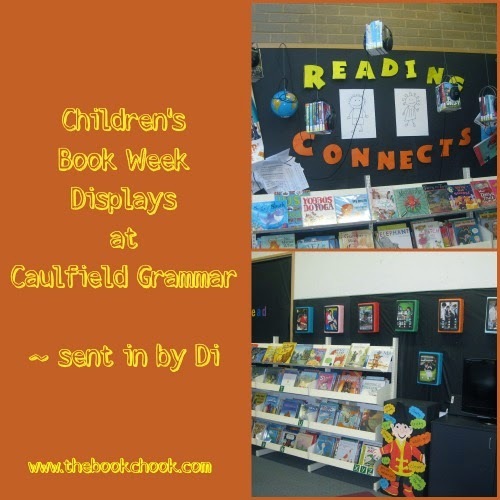 Great "connect to reading" ideas from Caulfield Grammar's Book Week displays. Photos (above) sent in by Di. 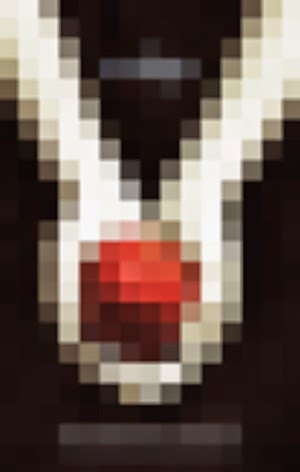 TL Sharon has created pixelated book covers of books in her library as part of a trivia competition, using pixelator and blurring tools. Above you'll see an example for the book, Twilight. You will find more tips that may prompt your own idea in Last Minute Activities for Children’s Book Week 2013. * For older kids, how about a large mind map, with the focal point a kind of Monty Python style human head, opened or skull ajar like this, with arrows pointing to different ways we connect to reading and/or different ways reading connects us. The connection things could be created by kids in all sorts of visual media. * There’s a jigsaw style font at FontSpace you could use as a model for a large Connect to Reading heading. There’s also a foldable 3D letter printable font. * Take a peek at the way other schools are setting up displays for Book Week. 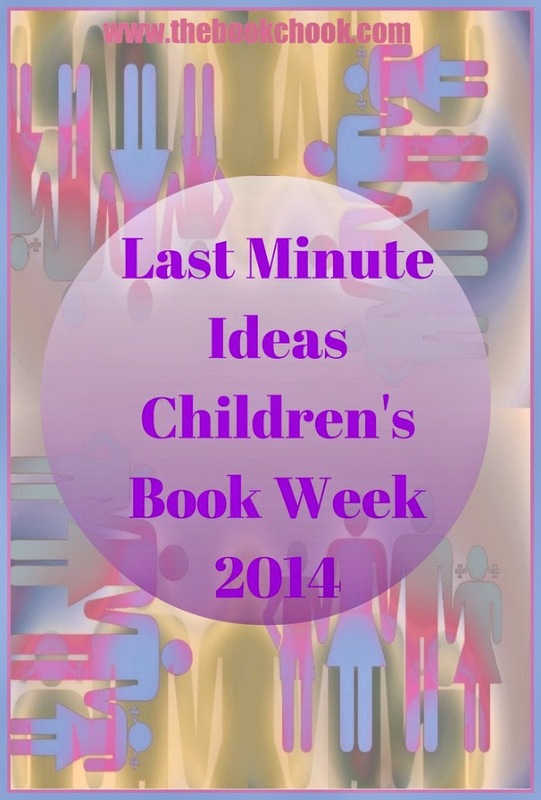 Try using the Twitter hashtag #bookweek2014 to come up with more ideas or to share your own. * For younger kids, how about a huge collage of lots of different kinds of reading we do. This could be photos, pics ripped out of old magazines, words, photos of themselves reading etc. So it wouldn’t be a hodgepodge and visually confusing, look for a way of standardising the presentation e.g. a black paper/card circle to confine each image to. You could also consider “popping out” from the vertical with origami attached to a circle, or paper sculpture. * Ask children the question: What would a really “connected” person look like? Put up a large silhouette of a person and have kids suggest ways we “connect” generally. For example, headphones, iPod, sport monitor, GPS, CCTV, chats in real life, mobile phone….which ones involve reading? One colour for those. Different colour for others. How can we portray connecting across the world? * While a "display board” is often expected, this theme really lends itself to multimedia presentations, and fits right into ideas in the Australian Curriculum. Lots of kids have access to phones and tablets that can make little videos, so challenge them to express their connections to reading that way too. If they don’t want connect to reading, make a case for that! Send it up, send themselves up for valuing illiteracy, whatever, but CREATE something. These could then be displayed on various monitors, or on a class blog. * If you’re short on time, don’t discount posters and comics. Have kids think of a time in their lives when they genuinely remember connecting a book to their own lives, and ask them to communicate that idea to an audience. Is there a book that connects in any way to another book? Is there a book that makes them think of a movie, song, poem? Is there a book that reminds them of something they know that happened in the real world? Create a comic about it, or display the ideas on a poster - arrange these around a central heading and add captions where necessary. * Have each child trace around her hand on black paper. Each finger needs to be decorated thus: thumb has student’s name; pointer finger, middle finger, ring finger and little finger each have a book title that she connected with. The decoration is in the form of titles and name in decent size font, each in a text box, then cut out to separate, then decorated around the title with coloured pencil. Year 2 onwards might be able do this without too much supervision on the computer. Students glue the small pieces of paper over the fingers and thumb. The finished hands radiate out from a central Connect to Reading heading on a display board. * Go paper-free and challenge kids to choreograph a dance about the theme, Connect to Reading, and video it. Or devise a skit including the characters from a book and the movie it connects to. * Have a class vote on/choose one favourite book. Each student must pick one way they connected to the theme of, or a character, setting etc in that book. They create SOMETHING to show that connection. The focus becomes the book/bookcover/title and it’s connected by ribbon to kids’ creations. If you've benefitted from this post, or any others at The Book Chook, I'd love you to help me spread my literacy, learning and literature ideas by promoting via Twitter, Pinterest, Facebook, StumbleUpon, G+ or any other way you decide. Kylie, thanks for letting me know. I'll investigate. Try again on Monday, by when I may have fixed the problem. Actually, I think I fixed it already. Thanks again for your notification, Kylie.